My mother translated Elena Ferrante’s The Story of the Lost Child from Italian for both of us to read together. What I learned about literature and family when I got my mom to translate the fourth Neapolitan novel for both of us to read together. As a fairly obsessive, bookish kid, I frequently stayed up all night, flashlight under the covers, to finish a particularly good story. My adult life usually precludes this kind of behavior, but sometimes, given the right prod, I find I’m not all that different from the girl I was then. The last time this happened was about a year ago, when I finished Elena Ferrante’s My Brilliant Friend at 3 a.m. on a weeknight, immediately downloaded the sequel, The Story of a New Name, and started its first chapter. Part of the compulsion was structural—Ferrante writes very short chapters and cliffhanger endings—but it also came from an urgent feeling of connection to the characters, as if they were tugging me along on their turbulent path. But with the third book in the series, Those Who Leave and Those Who Stay, quickly dispatched, I was stuck: the final book had been published in Italian, but wouldn’t be released in English for a year. Like an addict, I schemed for a way to get my fix. Thankfully, Ferrante Fever has a high basic reproduction number, so I casually recommended the books to my mother, who is retired and has been studying Italian for several years. Once she was hooked, I suggested that she might, in her spare time, feel like translating the last novel, The Story of the Lost Child. She sent me the first chapter on Jan. 3; the last chapter should arrive just after the official translation is published by Europa Editions on Sept. 1. It took me two days to read the third volume in the series. It will take us about nine months to read this fourth and final one. From the beginning, in first grade, the bond between the brilliant friends of the series, Elena and Lila, involves reading and writing. Elena is a praise-seeking student who uses school to escape an unhappy family life, most acutely an abusive, limping mother. Lila is very smart and “very bad,” as Elena tell us: “Her quickness of mind was like a hiss, a dart, a lethal bite.” The difficulties and the pleasures of keeping up with Lila motivate Elena who, after her parents grudgingly allow her to continue in school, eventually becomes a successful novelist. She proves to be the tortoise to Lila’s hare, stubbornly devoted to studying, which eventually lifts her out of poverty. Lila’s more impetuous choices, beginning with marriage at 16, give her a more limited and ultimately darker life. And yet Elena, in both her personal and professional life, can’t leave Lila behind. Lila expressly forbids Elena to write anything about her, and it is only after Lila disappears at the age of 66 that Elena grabs hold of “the unreliable measuring device of words” to write the 1,600 pages of these novels: an act of love and, simultaneously, of revenge. For my mother, translating the 451 pages of this book was—I hope!—a slightly less fraught endeavor. I live in the U.K. and my mom lives in the U.S., and the project was an easy addition to our largely Internet-based communication. She emailed me the chapters as she finished them; I responded; we discussed the plot twists via Gchat and Skype. Her initially steady rate of a chapter a day dilated and contracted through vacations and moves. Perhaps in part due to the Italian subject matter, I came to think of what we were doing as Slow Reading. Sometimes it felt like a book club, sometimes like reading a Victorian novel, and sometimes like reading the discursive recaps for a serialized TV show. What it did not feel like is my “normal” reading for pleasure, which is frequently a speedy, greedy gulping of plot and language. Not all reading is like this, of course, but binging on culture-on-demand is so common now that Slow Reading has felt very distinctive. Like strolling down a road rather than driving on it, my experience of the book has been both more expansive and more inclusive; I was more likely to make connections between it and the events of my own life in a way that felt creative or active. And like taking a college seminar, reading in correspondence had the pleasing effect of giving me access to someone else’s insights. My mom, an avid reader of detective novels, pointed out that several violent killings taking place in Elena’s neighborhood had the flavor of a murder mystery, and she pointed out things that were “missing” from the books, which I wouldn’t have noticed: for instance, there are very few descriptions of music, nor are there any of the loving descriptions of food that pepper other Italian novels popular in the English-speaking world. Here, Ferrante uses a verb, “smarginare,” that seems kind of rare and means something like cropping a photo, or reducing the margins of a book; alternatively, it has to do with removing the margins from a page of lead type before disassembling it. For people like Elena and Lila, to whom physical books are precious, the nuances of the Italian word are beautiful and evocative in a way that “de-marginalized” or “dissolving boundaries” can’t match. Being able to partially access this bit of the original language felt particularly relevant in reading these books, in which Elena’s own life is often influenced by the distinctions between Neapolitan dialect and Italian. And it might go further than that: in a fascinating article called “To Translate Is to Betray,” Rebecca Falkoff speculates that the mysterious Ferrante herself might be a translator. My mom, of course, found and sent me the article. 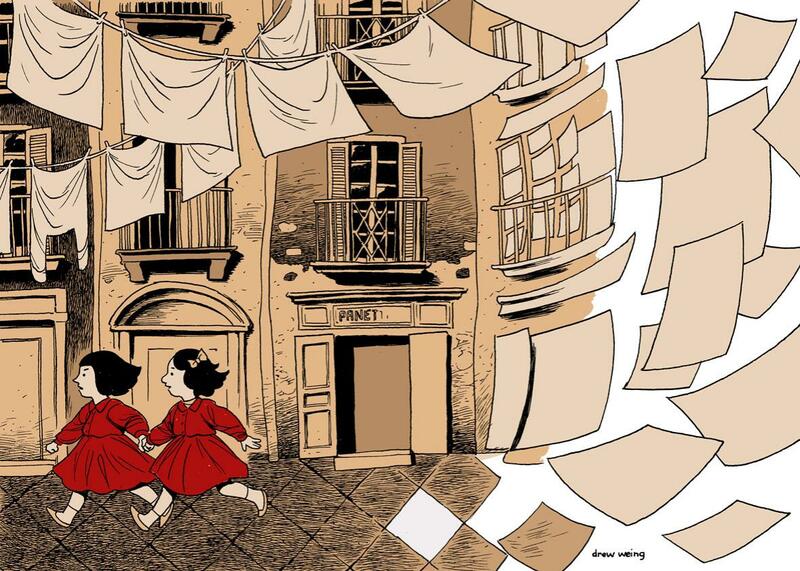 To me, and I think to many of Ferrante’s readers, one of the best things about the book is the way that the relationship between Elena and Lila feels true, in the sense that it portrays the complicated nature of close relationships—perhaps especially between women—in which tenderness and admiration exist inseparably from jealousy and competition. Lila sees “dissolving boundaries” most often in the men with whom she has painful and unequal relationships: an unwanted suitor, a bad husband, a difficult brother. The boundaries between her and Elena are also imprecise, but in a way that is ultimately a solace and a prod to both women: “It was good just to see each other every so often to hear the mad sound of the brain of one echo in the mad sound of the brain of the other.” The relationship where you love someone and yet they drive you crazy, a relationship that leaves you feeling doubled and blurred: This is, I’ve realized, also the kind of feeling you find between mothers and daughters. For the fear of becoming your parent is one way this kind of blurring happens. The fear of passing on undesirable traits to your children is another. Both are vivid to Elena, but over the six decades covered by the books, they change in a way that also feels true. For example, Elena is appalled as a child by the notion that she might develop a limp like her mother. Later, when her mother comes to care for her during an illness, she sees the limp differently: “I felt the energy she gave off, and I thought that her lameness had required her to have greater strength than normal, in order to survive.” And when she does develop a limp, she eventually comes to see it as an agreeable distinguishing trait. For my mom and me—who, like all mothers and daughters, sometimes have a difficult relationship—the novels have given us a way to stay in closer touch and a subject to return to and discuss. My mother’s slow translation has worked so well in part because the books are so precise about how reading and writing can ease the seam between two people, or even inside one person. After a trying encounter with Lila, Elena tells us that “What finally restored me to myself—but what myself?—was the proofs of the book: a hundred and thirty-nine pages, thick paper, the words of the notebook, fixed by my handwriting, which had become pleasantly alien thanks to the printed characters.” That book, and the other boundaries that work in these books, are like ligaments connecting bones: a thing that joins two solid objects, but which permits them to move separately, and which has enough give to allow for unforeseen changes. The joy of reading these volumes is that you find them not only in the stories, but in the world, and in the echo between them.